A Wonderful Seminar Week Comes to a Close | NJNA is Blogging! I have been so fortunate to have spent so much time in the past three weeks stitching with friends and learning new things. I now have a wealth of things to work on during the dreary days of winter. You will see a big change in Zelda tonight as she now has a tail! Her ear hair has had it's first trimming. I need to wait for the final trimming sessions until I purchase a pair of sharp scissors with skinny blades that whisper when you cut. It was not as difficult to attach the tail as I had thought. This technique would be great for pig tails! The tail will be shortened and attached again on the rump when all the stitching is complete. 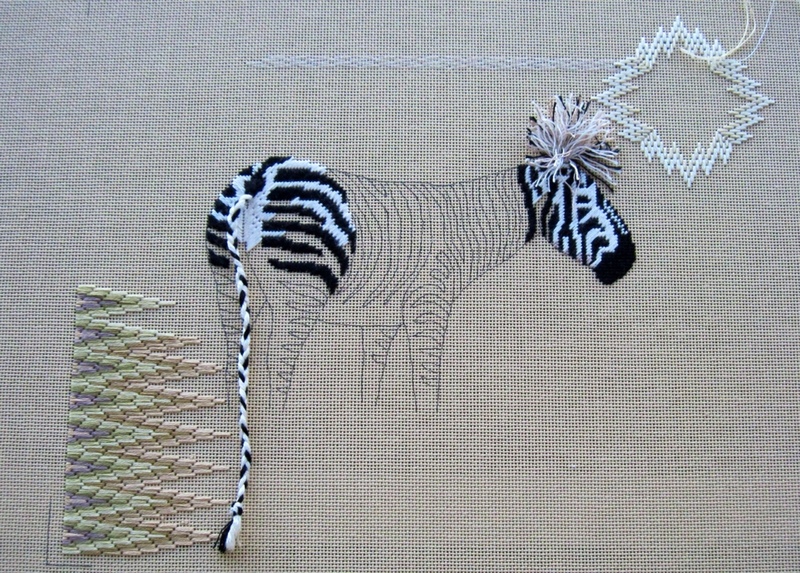 As it is now, it will be easy to move it aside to complete stitching the zebra. You will see that there is more added to the florentine ground. This was a case of two steps forward and one back. I need a quiet time to make sure that I don't mix up the color I should be using. I also added a bit to the sun. It took me so long to find where I was in the pattern that I did not straight round three! I did write a note as to where I left off in the design. The last thing we tackled today was the grasses of which you can see none. We can't add the grasses until the florentine ground is complete. The directions and Gale's demonstration will make that easy to do.